1 - The placement test result is valid for only 45 days. 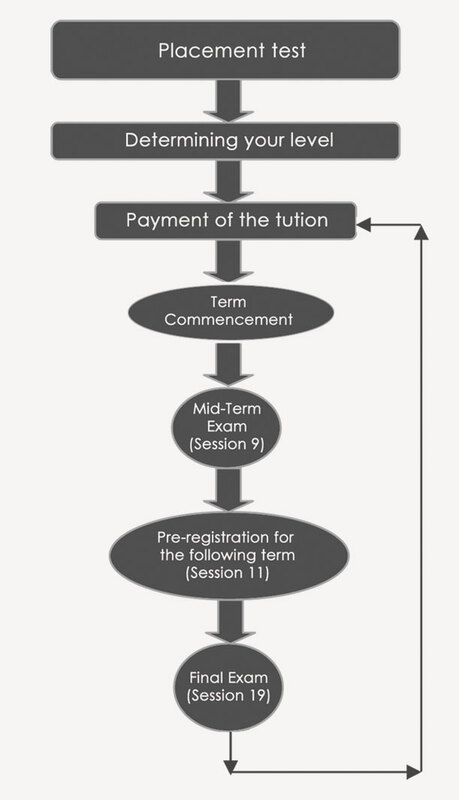 2 - You should complete your registration at least 48 hours prior to the commencement of the term. 3 - Term duration is a month and a half, and each session is 1 hour and 45 minutes. 4 - Registration slip is to be submitted to the course instructor at the first session. 5 - You are allowed only 3 absences per term. 6 - Each class is scheduled to have one movie session throughout the term. 7 - Top students will be awarded a 10% discount for the following term. 8 - You can access your final and midterm scores on our website 48 hours after test administration.